There is nothing worse than feeling like my face is melting on a hot summer day. The good news is that often times it’s the products we apply that make us feel this way. After a lot of trial and error, I’ve compiled a list of the 9 best moisturizers and moisturizer enhancers to use for the summer weather to counterbalance those hot days. I’m a bit beauty obsessed. To me, good skin is the perfect canvas — for makeup, jewelry, clothing. After all, your skin takes up the most space on your body. When it comes to facial skin, there is no easy way to truly pull off naturally beautiful skin unless you really invest in your daily beauty routine. I wanted to share with you my tried and true 9 favorite facial cream products and why I love and recommend them. Biossance Squalane + Probiotic Gel Moisturizer // This moisturizer makes me feel like I just splashed my face with fresh cooling water on a hot sticky day. Although it is weightless, it works wonders on locking in moisture to keep my skin hydrated all day. It also reduces the appearance of pores which I love since I have some issues with the pores on my nose. After using this for a few weeks my skin feels the benefits even if I haven’t applied the moisturizer. I really recommend using this during the summer season. Biossance Squalane + Mineral SPF 45 // Protecting your skin from the sun is not an option, it’s a must. A lot of facial sunscreens I’ve tried feel too heavy or leave my skin feeling like it can’t breathe. The Biossance sunscreen is weightless, works as a great primer before applying makeup, or on makeup-less days, gives a nice dewy look. Sometimes I mix in another moisturizer with this sunscreen based on my skins needs for the day. I have yet to find another sunscreen that feels as fresh when applied. Dr Dennis Gross Hyaluronic Marine™ Oil-Free Moisture Cushion // The surface of my skin easily becomes dry and oily products end up feeling too heavy and makes me feel like my skin can’t breathe. This water-break gel-cream is similar to the way the Biossance makes me feel. Upon applying, my skin feels like it’s gotten a splash of fresh water however it is slightly more heavy in comparison to Biossance. Depending on how warm it is, I go back and forth between the two creams on the warmer summer days. This cream never lets me down when it comes to keeping my skin hydrated and looking plump. Herbivore Rosewater Moisture Cream // Out of all the creams mentioned here, this one is on the heavier side when applying however it isn’t greasy or even oily which is amazing. I love to apply this one at the end of the day after I take a shower and right before I go to bed. Out of all the creams in this list, the Herbivore Rosewater Moisture Cream leaves my skin the most dewy. You also only need a very small amount to get the job done as a little goes a long way. This is a season-less moisturizer as I find in both summer and winter, i’m constantly grabbing for this cream. Peter Thomas Roth Water Drench Hyaluronic Cloud Cream // I’m obsessed with hyaluronic acid and this contains 30% concentrated hyaluronic acid, making it a potent hydrator. Hyaluronic hydrates your skin quickly while being lightweight so it’s a go-to ingredient for me. It also is amazing at making fine lines on your face disappear. I love seeing the way its reduced lines on my forehead and my smile lines. This product really keeps my skin baby soft and forever youthful. If you are 25+ in age, I highly recommend incorporating this cream into your routine. 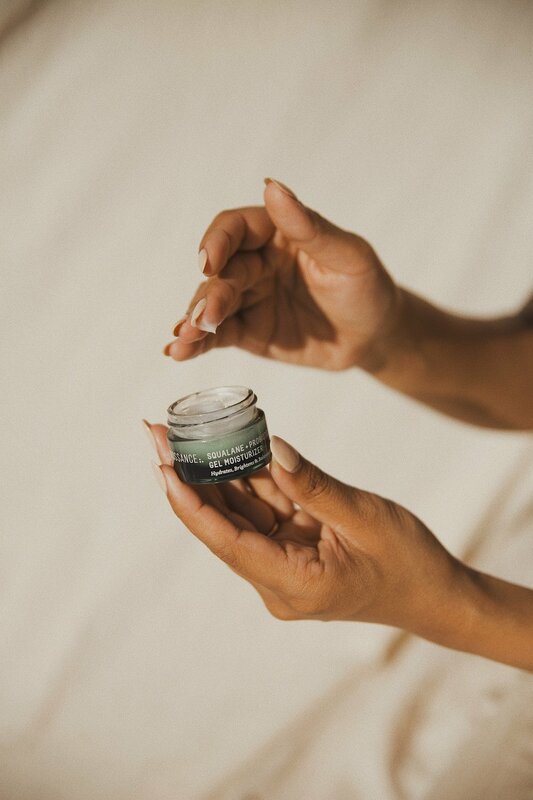 Perricone MD H2 Elemental Energy Hydrating Cloud Cream // This cream is lightweight and prevents your skin against aging while keeping it hydrated all throughout the day. After using it for a few weeks, I notice how much more radiant and tighter my skin becomes. True Botanicals Repair Serum // Unlike the other cream suggestions, this is a serum that is to be used specifically overnight. It keeps the moisturize locked into my skin and improves the texture making it smoother over time. I love to mix in the True Botanicals Vitamin C Booster for the ultimate skin serum. True Botanicals Vitamin C Booster // Vitamin C is extremely healthy for your skin and this product contains vitamin c and ferulic acid in loose powder-form. This product brightens dark areas, smooths texture, and firms. Products which come pre-mixed with Vitamin C loose their potency so it’s best to mix in the powder form right before use. I love how quickly I see my skin becoming brighter with the use of this product. Tata Harper Illuminating Moisturizer // I love this moisturizer for when I want to add some highlight. It not only hydrates my skin but the real diamond dust in the product adds a finishing touch of radiance.